Bleeding Shadows is Joe R. Lansdale's largest, most varied collection to date. Weighing in at 488 pages and 150,000 words, these stories, poems, and novellas--supplemented by the author's introduction and by an invaluable set of story notes--move effortlessly from horror, adventure, and suspense to literary pastiche. It is, by any measure, a major addition to an already impressive body of work. The volume opens with 'Torn Away,' in which a small town sheriff encounters a man on the run from his own predatory shadow. The stories that follow come from all points of the narrative compass. In 'Morning, Noon, and Night,' a young boy stumbles across a monstrous, multi-faceted killer from which there is no escape. 'The Bleeding Shadow' is a tale of music, monsters, and deals-with-the devil set in post-WWII Texas. In 'Star Light, Eyes Bright,' an ordinary husband makes a startling discovery, one that leads to an unimaginable act of personal transformation. Elsewhere, the author offers us twisted Christmas stories ('Santa at the Cafe'), tales of a zombie apocalypse ('A Visit with Friends'), and one story--'Christmas with the Dead'--that encompasses both of these elements. Other highlights include a pair of informed, affectionate acts of literary homage. 'Metal Men of Mars' pays tribute to the Martian novels of Edgar Rice Burroughs, while in 'Dread Island,' the masterful novella that concludes this collection, the world of Huckleberry Finn merges seamlessly with the worlds of H. P. Lovecraft and Joel Chandler Harris. Sometimes funny, often horrifying, and always compulsively readable, this generous gathering of stories--few of which have previously appeared in book form--constitutes a significant publishing event. 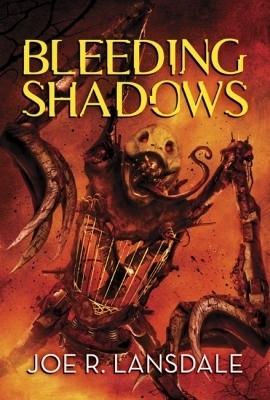 Bleeding Shadows is an indispensable, vastly entertaining volume, one that no admirer of Joe R. Lansdale's distinctive brand of fiction can afford to miss. Lansdale is a man of many talents, with his literary travels taking him - quite literally - all over the map. Perhaps best known for his Hap and Leonard novels, I first discovered him through The Drive-In series, before becoming a fan forever with Bubba Ho-Tep. Yes, before Bruce Campbell made the role his own on the screen, Elvis faced off against the soul-sucking mummy on the page, courtesy of Joe R. Lansdale. That alone should be enough to convince you he's worth a read. He wrote Bubba Ho-Tep? Nice. Like that his work has a Lovecraft feel. And that is one wicked cover. OOh intriguing! Never heard of this author before! Hope you enjoy it once you read it!